Want to really revitalize your shower -- and yourself? Reach for a tube of Bliss Super Minty Soap 'n Scrub. The cult favorite from Bliss, the Bliss Mammoth Minty Scrub Soap, has been transformed into this zingy, refreshing scrub. Trust me when I tell you it's bound to leave behind soft skin and a renewed zest for life! Peppermint and jojoba beads blend together to create a tingly, exfoliating experience. I like to use this scrub after I've lathered up with body wash -- it's a great way to get rid of any lingering dryness. And it's definitely super minty! 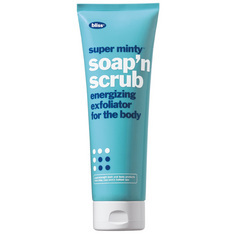 Bliss Super Minty Soap 'n Scrub retails for $32 at blissworld.com.